Artist’s impression of the HH-60W combat rescue helicopter (CRH). Photo courtesy of Sikorsky. UH-60M Black Hawk helicopter is the base platform for the design of the HH-60W CRH. Photo courtesy of defenseimagery.mil. The HH-60W Combat Rescue Helicopter (CRH) will integrate Rockwell Collins ARC-210 V/UHF communication system. Image courtesy of Rockwell Collins. The HH-60W Combat Rescue Helicopter (CRH) is being developed by Sikorsky Aircraft Corporation in co-operation with Lockheed Martin for the US Air Force’s (USAF) CRH programme. It is an advanced variant of the combat-proven UH-60M Black Hawk helicopter. The new 60-Whiskey helicopter will replace HH-60G Pave Hawk medium-lift, combat search-and-rescue (CSAR) vehicle that entered service with the USAF in 1982. The HH-60W can be deployed in casualty evacuation (CASEVAC), medical evacuation (MEDEVAC), non-combatant evacuation missions, civil search-and-rescue, humanitarian aid, disaster relief, and insertion or extraction of combat forces. 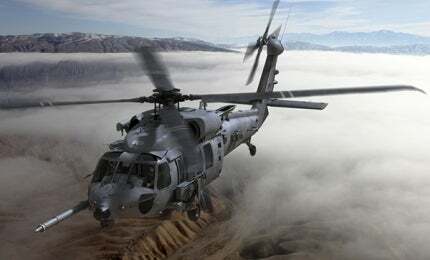 The USAF announced the replacement of its aging HH-60G helicopters with new CRH in 2010. A request for proposal (RFP) was issued for the CRH programme in October 2012. Sikorsky teamed up with major subsystems supplier Lockheed Martin to offer a UH-60M derivative as the USAF’s new combat rescue helicopter. In June 2014, the USAF awarded a $1.2bn engineering, manufacturing and development (EMD) contract to the Sikorsky-Lockheed Martin team to provide the next-generation combat rescue helicopter fleet. The scope of the contract covers development and integration of the rescue mission systems, four helicopters, as well as seven aircrew and maintenance training systems. The contract also includes options for the production of 112 HH-60W helicopters. The Sikorsky-Lockheed Martin team will deliver the helicopters with most advanced capabilities to support all services in combat. The new combat rescue helicopter was officially named as the HH-60W by the USAF in November 2014. The preliminary design review (PDR) of the HH-60W was completed in May 2016, whereas the vehicle critical design review (CDR) was concluded in September 2017. The training systems CDR is expected in September 2017. The USAF plans to conduct the first test flight of HH-60W CRH in 2019 for fielding an operational helicopter in 2021, while full-rate production is anticipated by 2023. The design of HH-60W is based on the next-generation UH-60M Black Hawk helicopter. The rotorcraft integrates a crashworthy and damage-tolerant airframe. It retains composite, wide-chord; main rotor blades; and corrosion-resistant structures of its predecessor. The helicopter will offer increased internal fuel capability than the HH-60G helicopter. It will deliver longer range, while offering a larger internal cabin space. It can accommodate two pilots, two gunners, two paramedics and two litters for medical patients or injured service members. Either side of the fuselage can be mounted with .50 calibre and 7.62mm machine guns. The Eurocopter Company manufactures the Cougar family of twin engine helicopters, of which more than 350 have been ordered. The helicopter will be equipped with Lockheed Martin’s mission planning system, defensive aids, data links, mission computers and adverse weather sensors. The advanced glass cockpit will accommodate two pilots side-by-side. It will be equipped with Rockwell Collins’ state-of-the art avionics and mission equipment, including cockpit flight and mission display system, navigation radios and the advanced ARC-210 V/UHF communication system. The ARC-210 offers secure voice communications and civil interoperability. The system supports the integration of future advanced ad hoc networks and next-generation mobile user objective system (MUOS) satellite communication (SATCOM) for uninterrupted voice and data. The multi-function displays (MFDs) aboard the cockpit will comply with the latest night-vision imaging system (NVIS) standards. The MFDs will support wide viewing angles for superior cross-cockpit viewing. The integrated cockpit flight and mission display system will deliver superior situational awareness while reducing pilot workload during CSAR missions. The power-plant of HH-60W will integrate two General Electric T700-GE-701D turbo-shaft engines, which will each develop a maximum continuous power of 1,716shp (1,279kW) and offer superior performance in adverse weather conditions.